Can big data make for great art? 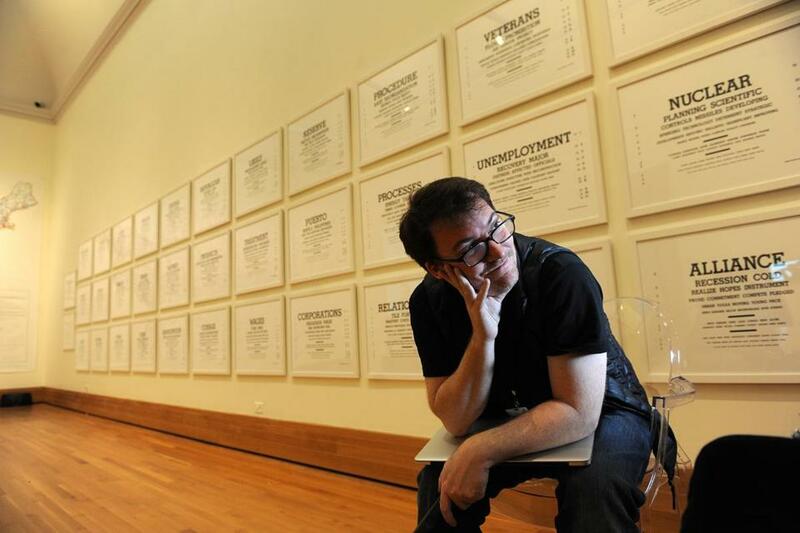 R. Luke DuBois at the Bowdoin College Museum of Art, where his exhibit is on display. 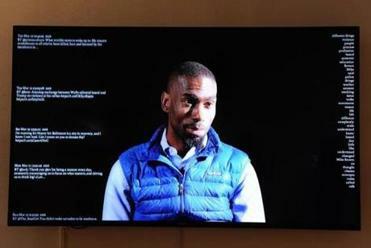 DeRay McKesson, a Bowdoin College graduate and Black Lives Matter activist, is featured in one of the works by R. Luke DuBois at Bowdoin. BRUNSWICK, Maine — A few years back, R. Luke DuBois signed on to 21 dating sites and downloaded 19 million profiles. No, he wasn’t that desperate. DuBois is an artist, and his material is information. Like Nate Silver, the statistical analyst who makes informed projections about elections and sports matchups, DuBois mines data, but he’s more intrigued with American identity than he is with competitions. The piece, a sprawling map of the United States covered with such key words, fills one wall of “R. Luke DuBois — Now,” on view at the Bowdoin College Museum of Art. Like Silver, he has a keen interest in politics. His “Hindsight Is Always 20/20,” commissioned for the 2008 Democratic National Convention, comprises more than 40 eye charts, each representing a US president. Each chart lists the words most used in that president’s State of the Union addresses, with the most frequent word in the biggest type at the top. George W. Bush: Terror. Richard Nixon: Truly. DuBois was wrapping up installation of the show, which was organized by the John and Mable Ringling Museum of Art. Nearly everything was up and running — video screens flickered, music moaned. For the portrait, DuBois crowd-sourced Bowdoin students for questions to ask McKesson. The activist answers them in a 45-minute video interview. Themes such as race and education arise, and are listed on one side of the screen. As McKesson addresses them, recent tweets from his Twitter feed touching on those topics scroll down the other side. Culling through the stuff of our shared media — tweets, Google searches, YouTube videos, and more — DuBois captures in-the-moment, constantly evolving snapshots of American culture. 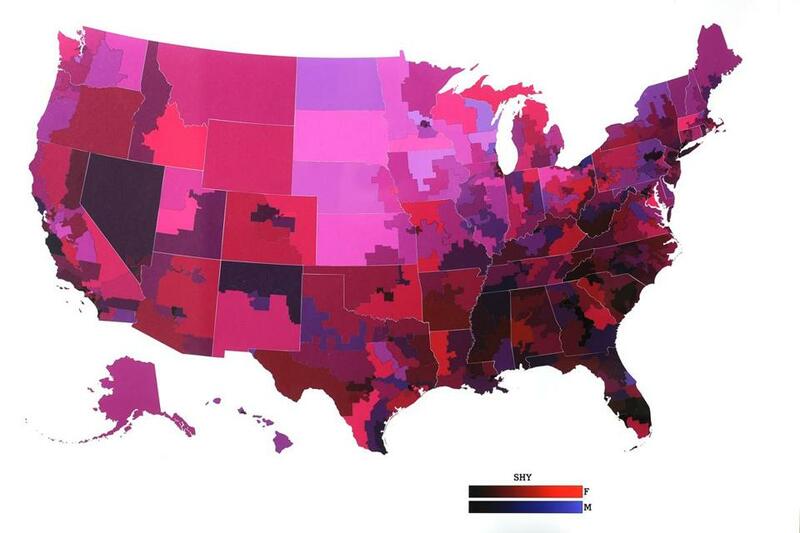 A map tracking shyness in America. Time plays a crucial role in DuBois’s work. He’s a composer, with a doctorate in music composition from Columbia University, and his passion for music underlines everything. “The vibrato becomes microtonal, and creates this crazy shimmer,” he said. “It sounds like an adhan, the call to prayer at a mosque. Music brought him to visual art by way of live projections during concerts — “VJ stuff,” as DuBois put it. Then he realized the imagery could more closely reflect the content of the music, and vice versa. In time, that led to DuBois’s “Hard Data,” a website (archive.turbulence.org/Works/harddata) that sifts through information about the Iraq War, and charts it on a timeline. It’s an open source for artists to use as the basis for their own compositions. He wrote a string quartet using casualty statistics, sorting the data stream into six movements: one for each year of the war. His music for “Hard Data” follows in the tradition of composers such as Igor Stravinsky and Iannis Xenakis, who wrote music influenced by war. DuBois looked around the gallery at the maps, charts, and videos, including one, “Academy,” speeding chronologically through Oscar-winning films for best picture, one per minute. A viewer can spot developments and trends in filmmaking, such as tracking shots. “People tell me all the time that nobody used to do this stuff,” he said. “I think of it like music. Notes and chords and keys in a pattern. It’s data. We’ve been doing music for 40,000 years.